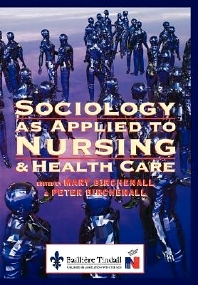 This text is designed specifically to discuss sociological ideas and theories in terms of their relationship to nursing and the health care context in which they take place. Provides an accessible introduction to major sociological themes and ideas with topics that include an introduction to the sociology of health care, inequalities in health, the social context of nursing, and more. Each chapter contains case studies and examples which link to a variety of settings and client groups. Reflection and discussion questions encourage critical thinking. Also contains a helpful glossary of sociological terminology. Section 1: Introducing the Sociology of Health Care. Studying Sociology in Nursing. Sociology and Everyday Life. Society and the Individual: Gender, Race and Age. Introducing Theory in Sociology. Section 2: Inequalities in Health. Poverty in Health Care. Disadvantaged Groups in Health Care. The Social Interpretation of Deviance. Section 3: The Social Context of Nursing. Nurses, Clients and Power. Professional and Educational Directions. Section 4: Health Policy in Relation to Nursing. The Changing Shape of the National Health Service. Caring in a Mixed Economy. Section 5: Sociological Perspectives in Nursing. Nursing and Social Theory. Glossary.